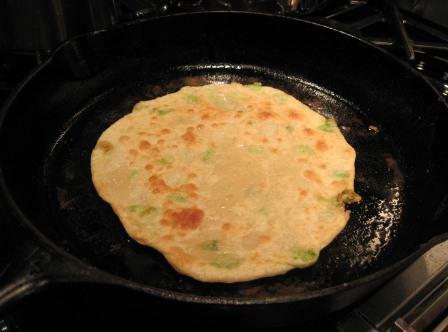 Every time I try a new Chinese restaurant, I scan the menu hopefully for scallion pancakes. I love them, but it’s hard to find good ones. Too often they’re thick, doughy, with too little scallion flavor. It finally occurred to me that I should try making them myself. 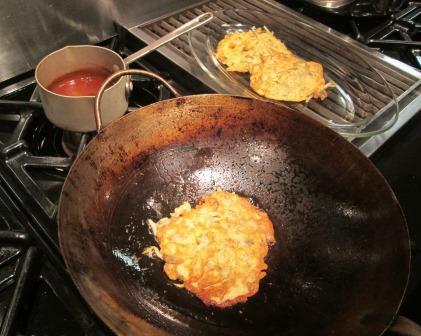 I have two Chinese cookbooks with scallion pancake recipes. One turned me off by specifying western brand names for flour and vegetable shortening. The other looked more authentic, so I chose it. 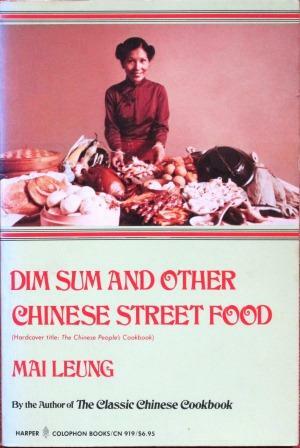 The book is Dim Sum and Other Chinese Street Food, by Mai Leung. 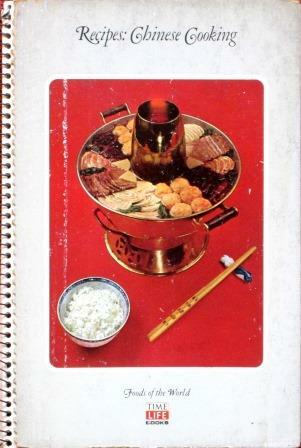 I’ve had good luck with another of her cookbooks, and I was intrigued by the drawings in this one demonstrating the strange technique for shaping Chung Yao Bing, or Crisp Scallion Cakes. I was also heartened by the fact that the recipe called for lard, not tasteless vegetable shortening. Preparing the cakes was a gloriously messy process, with drifts of flour all over my kitchen counter. It starts with a very soft flour-water dough. The pieces rolled out easily to 11-inch circles. The first tricky step was to, “with your fingers,” evenly spread a tablespoon of lard on each circle. My lard, even though I’d taken it out of the refrigerator to soften hours before, persisted in glomming onto my fingers, not smoothing over the dough. (Next time I’ll try melting it, letting it just reach room temperature, and painting it on with a brush.) But I wrestled it into sort-of submission and sprinkled on chopped scallions. Now, the recipe had me: (1) rolling the circle into a tight, narrow cylinder; (2) twisting it “like a rope”; (3) holding it vertically on the work surface and squishing it down into a lumpy round; and (4) rolling that out into a 10-inch cake. This last was not easy. 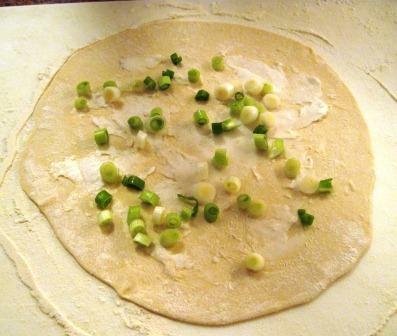 The twists made the dough very resistant to manipulation, and the scallions kept trying to break out of their coating. Using scads of flour, my heaviest rolling pin, and a lot of muscle power, I managed to achieve 9-inch circles. From there, it was easy. I fried the cakes in shallow peanut oil until they were a nice golden brown on both sides. Well, “nice golden brown” may not be quite the phrase: spotty golden brown would be more accurate. I wonder if my glommy distribution of the lard was what caused them to look so chicken-poxed. However that might be, the cakes were delicious, with bright scallion flavor. (All but the one on which I neglected to spread lard. That showed how important the fat is to this recipe – the cake without it was leaden, tough, bland.) They were in fact thin and crisp, not as thickly pancake-y as the ones I’ve had in restaurants. A dipping sauce of soy and hot oil made them even tastier. 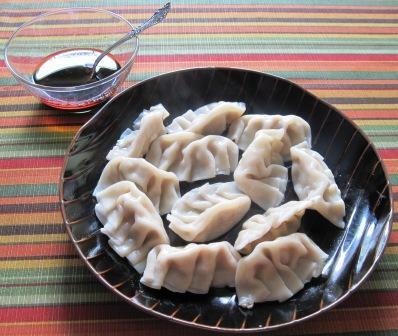 I may never qualify as a competent dim sum chef, but I certainly had fun making this recipe and eating the results. It’s the kind of food you first get your hands into and later onto: good stuff. Three of us did another big cook-in this week. 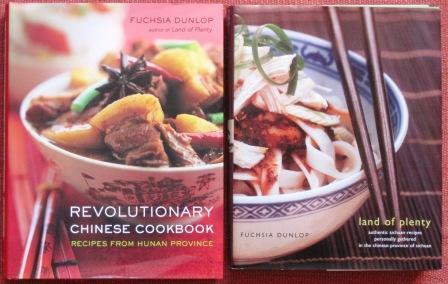 We based it on Fuchsia Dunlop’s two books, Land of Plenty: A Treasury of Authentic Sichuan Cooking and Revolutionary Chinese Cookbook: Recipes from Hunan Province. Tom, Hope, and I met well beforehand to plan the menu – all dishes new to all of us – check our pantry supplies, and organize the shopping lists for an extravaganza of a meal..
We started cooking at about 3:30 in the afternoon, doing the preliminary work for all the dishes – chopping, slicing, salting, parboiling, mixing sauces. Eventually there were so many little bowls of things on the counter that we had to put slips of paper under them saying which recipe they were for. Finally, all the advance prep was done, and we could proceed to the table, finishing the cooking of each course, eating it, and then finishing the next. We started with two appetizers: the peanuts and the cucumbers. The unroasted peanuts had been boiled for 40 minutes in water with Sichuan peppercorns, star anise, cinnamon bark, fennel seeds, and cloves; then left to dry out. The cucumbers had been smashed with a cleaver (fun! 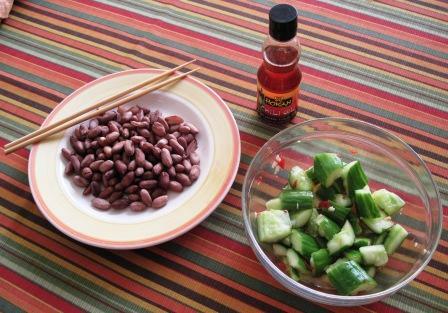 ), cut up, salted and drained, and dressed with chopped salted chilies, garlic, rice vinegar, sesame oil, and chili oil. The cucumbers were very nice, the peanuts rather odd and spongy-textured but good enough in their context. Next up were the dumplings (called “long” not for their shape but for the name of the restaurant they were a specialty of). The filling was ground pork mixed with rice wine, sesame oil, egg, broth, and what seemed like way too much water in which crushed ginger had been steeped. It started out looking like a gloppy mess, but we dutifully (if skeptically) stirred briskly – only in one direction, as Dunlop insisted – and the pork absorbed all the liquid. If we had stirred in the other direction, would the water have come back out? We filled the wonton wrappers (purchased, not homemade), pleated them into a traditional shape, and boiled them. 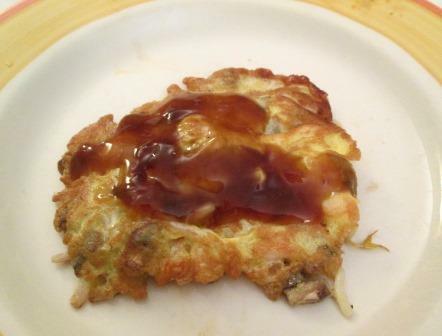 They were very good with a chile-oil dipping sauce, but we three felt that the addition of a little crunchy vegetable – water chestnut or chopped cabbage – to the filling might have pleased us more. We went on to the Dan Dan noodles. Restaurant versions of this fiery-hot dish had intimidated me in the past, but Tom and Hope love hot spicy food. The noodles were dressed first with a sauce of ground Sichuan pepper, sesame paste, light and dark soy sauce, and chili oil. 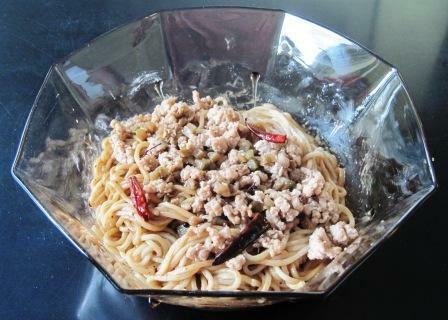 Then with a stir-fried topping of ground pork, whole dried chilies, whole Sichuan peppercorns, Sichuan preserved vegetable, and light soy sauce. The dish was, as Dunlop says, “shamelessly spicy” and “not for the fainthearted.” I actually enjoyed it, though I couldn’t eat as much of it as my two asbestos-mouthed companions. Quality of the noodles is crucial here: despite the heat, a firm texture in the mouth makes or breaks the dish. 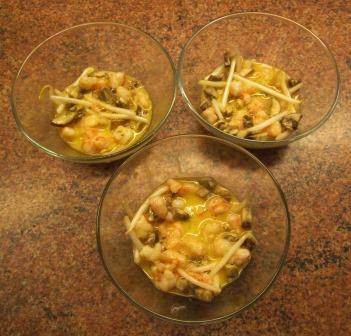 Our fourth course was the hotchpotch and the mushrooms. We weren’t expecting too much from the hotchpotch recipe, which is a stir-fry of marinated chicken livers, pickled chilies, pickled ginger, and a huge amount of celery, lightly thickened with cornstarch in chicken stock. It was amazingly good. 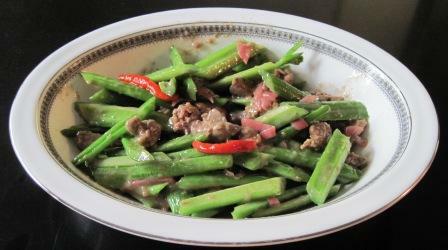 The crunch of the celery and the fresh chlorophyll jolt it provided just lifted the whole mélange above the ordinary. We did have high expectations for the mushroom recipe, but this time they weren’t met. We’d bought a quarter-pound each of shiitake, maitake, cloud ears, and cremini. 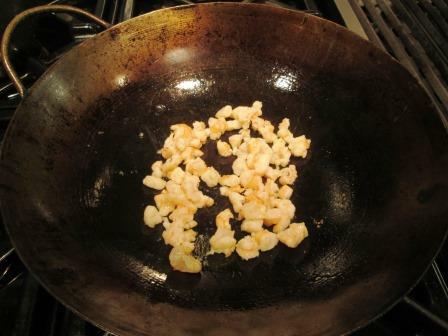 They were stir-fried with bacon, garlic, ginger, and dried chili flakes, then garnished with slivered scallions – all of which we thought would add sparkle to the different flavors of the mushrooms. Alas, not so. The dish was OK but bland: Everything sort of blurred together, losing much of the individual characters of those excellent mushrooms. We felt the need of jazzing up the dish with some of the dumplings’ dipping sauce. Bravely forging ahead, we went on to the fish and the green beans. 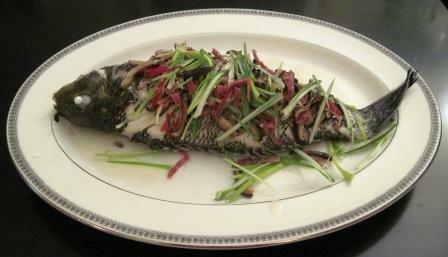 We tucked scallion whites into the belly of a sea bass, set him up on a plate, topped him with slivered shiitake, red chilis, ham, and ginger, plus a little peanut oil. 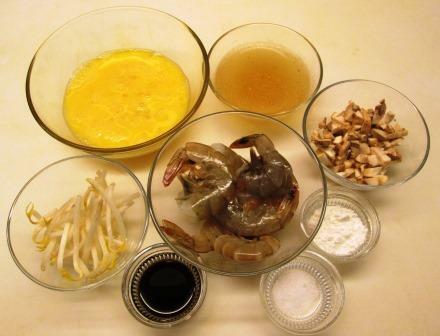 When steamed, we finished him with a splash of sizzling-hot peanut oil. 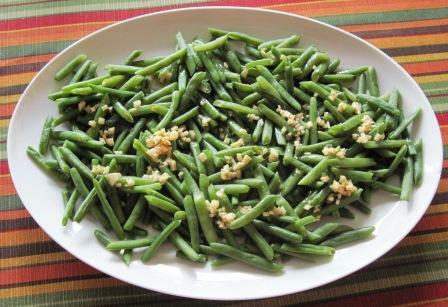 The French beans (recommended substitute for Asian yard-long beans) had been briefly boiled, cooled, and dressed with finely chopped ginger, black Chinese vinegar, and sesame oil. These were both excellent, beautifully light dishes with which to conclude a memorable feast. Throughout, we had drunk a succession of mineral-toned white wines – Abbazia di Novacella Kerner, Inama Soave, and Trimbach Riesling Cuvée Frederick Emile – which played well with the highly varied spicing of the different dishes. 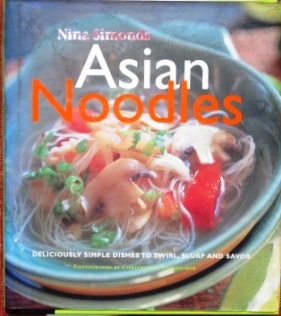 Nina Simonds’ Asian Noodles is a slim book with 75 recipes, most of them handsomely illustrated. (I’m not going to show food photos this week; I’ve beaten up on food stylists enough for a while.) Her Pad Thai is the best version of the dish I’ve eaten, in or out of Thai restaurants, and her Vietnamese Spring Rolls are delightful. So with pleasure I looked for a new recipe from the book to try. I chose Crisp-Cooked Vegetarian Noodles. This wasn’t specifically identified as a Chinese recipe, but it called for thin Chinese egg noodles (or angel hair pasta, which I used), dried Chinese black mushrooms, and Chinese rice wine. Although it looked very good, I felt that Chinese-style would be an accurate description of the recipe: Do cooks in China really use carrots and leeks as their main vegetables? Mainly, I was intrigued by the way the noodles are handled, which I’d never done before. They’re cooked, cooled, tossed with a bit of sesame oil, and broiled until golden. 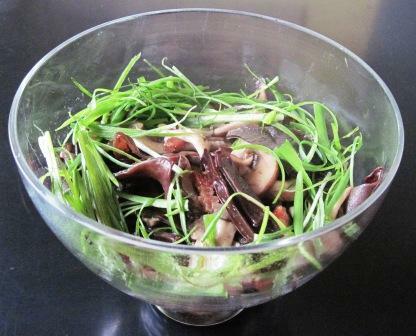 Then you stir-fry black mushrooms, garlic, ginger, lots of slivered carrots and leeks, and a dash of rice wine; stir in the mushroom soaking water, cornstarch, a little light soy, and a little sesame oil to make a sauce; and top the noodles with it all. 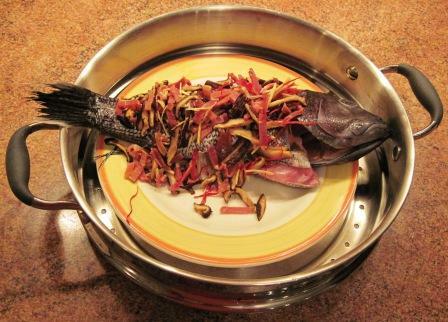 It was a pretty dish, and the noodles – some still soft and others crunchy – were texturally attractive. But I think Simonds oversells the recipe. Her headnote says “Even meat lovers will find this spicy noodle platter intoxicatingly good.” Well, Tom and I are meat lovers, sure enough, and we did find it satisfying. But it was far from spicy and in no way intoxicating, literally or metaphorically. It was in fact quite bland. The quantities of seasonings called for were extremely timid, compared to the Chinese cooking I’m used to. In short, we liked the idea of the dish and could envision a number of interesting variations, using different – more obviously Asian – vegetables. So the technique, if not the details, of the recipe may enter our kitchen repertoire. 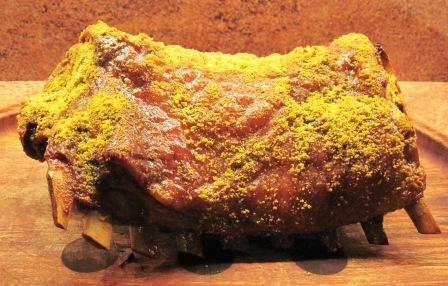 Last week I mentioned how much I liked Patrick O’Connell’s coating for the rack of lamb — mustard, brown sugar, and chopped pistachios. The other night I tried it on a loin roast of pork, and it was excellent. The pork was delicious in itself, being black (or Berkshire) pig, so the treatment was a bit like gilding the lily, but we all loved it. 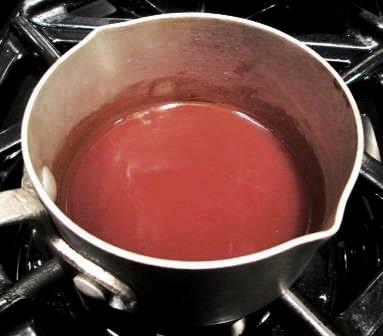 It made great gravy, too.